Hi everyone, it has been a few weeks since I’ve shard any of my crafty creations, and I’m not going to make excuse for it other then I was just being a slacker, lol. Anyways, don’t we just all love Spring time with the smell of fresh flowers in the air and the sound of birds chirping? Today I have a refreshing Spring time Monkey card to share. This lovely image called “Tulip Monkey” by CC Designs, It was stamped on Neenah Solar White card stock and colored with Faber Castell Polychromos pencils. I got the nice smooth look by blending the pencil with a blending stump and gamsol. After I was done coloring the cute little monkey panel I cut it with a stitched oval die and attached it to some fun phone before attaching it to the card. Monkeys face ~ Light, Medium, and Dark Flesh. Monkeys body ~ Bister, Burnt Sienna, Walnut Brown, and a little bit of Ivory. Blue/Green Tulip ~ Hookers Green, Dark Phthalo Green. Pink Tulip ~ Medium Flesh, Burnt Carmine. Sky ~ Cobalt Turquoise, Light Cobalt Turquoise. Grass ~ May Green, Earth Green Yellow, Pine Green. Bee ~ Dark Cadmium Yellow, Black. The lovely Springtime pattern paper is digital paper from Echo Park. The tulip pattern was adhered to the yellow Recollections cardstock base after using a We R memory Keeper’s Corner Chomp to cut the corners. I then layered on top of that the simple pattern blue/green paper only after using Lawn Fawn border Stitch die to add foux stitches to all four edges. Okay, let’s talk about the ribbon for a minute. There’s nothing really special about it, it’s just satin ribbon from Walmart but, I have a little tip to share with you. The tip is, use heat and bond when attaching wider pieces of ribbon. The heat and bond will create a barrier between the adhesive and ribbon so your adhesive will not show through your ribbon after it is attached to the card. Finally after all my layers where attached I added a nice big bow and some little bunnies that ywere cut with some My Treasured Kutz dies. 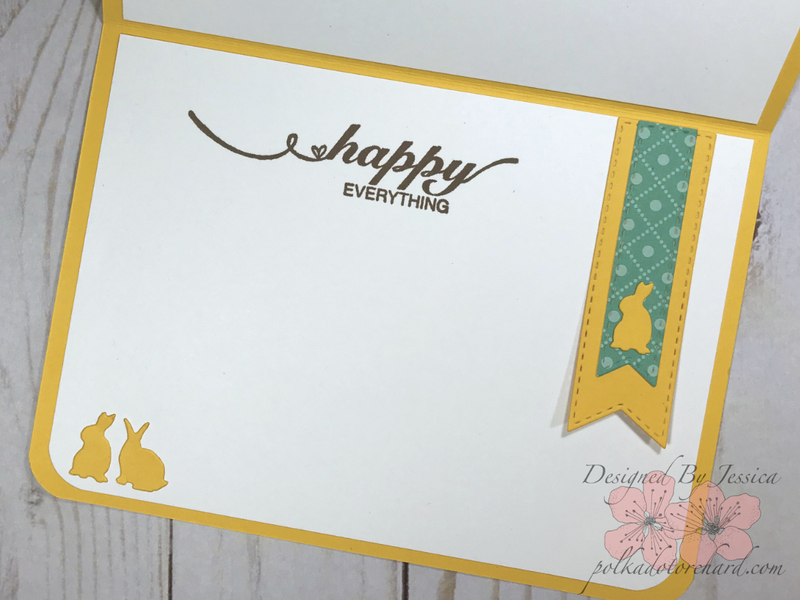 I finished up the front by adding a sititched banner with the sentiment “SOME BUNNY LOVES YOU” from the “Forest Friends” stamp set by Jaded Blossom. Then adding some brown sequins for a final touch. I just couldn’t stop with the front of the card, I had to make the inside look nice too. I absolutely love the sentiment I used “happy EVERYTHING”, It’s from Unity’s 1/17 kom “When You Smile”. I coordinated the front with the inside by layering some stitched banners with some of the same pattern paper and more of those cute MTK bunnies. Thanks for visiting Polka Dot Orchard and Happy Crafting!